Special Olympics Unified Sports® is a unique program that provides students with and without intellectual disabilities with opportunities to meaningfully participate in sports activities alongside one another in a variety of settings. Through the various models offered, schools are able to provide important inclusive sports experiences that work in tandem with Whole School Engagement and Inclusive Youth Leadership efforts. 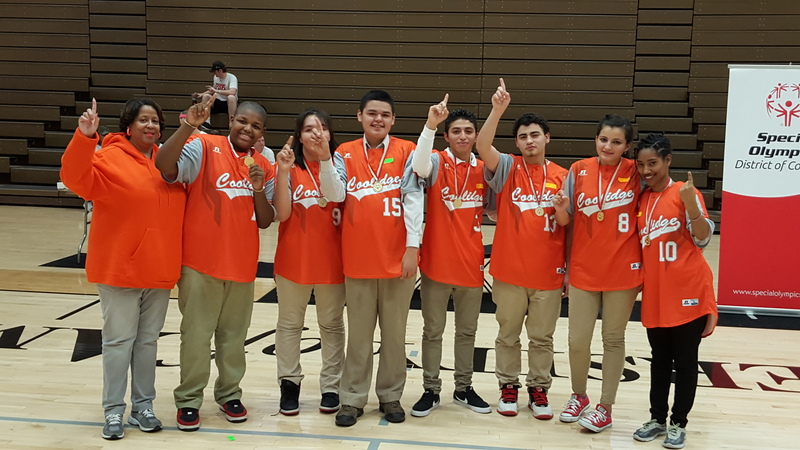 Participation in Unified Sports leads to new friendships, improved self-esteem and positive changes in attitudes, behavior and performance for all students involved. Learn more about the goals and principles of Unified Sports. With sports as the foundation, Special Olympics Unified Sports have been shown to help to reduce bullying and exclusion, promote healthy activity and interactions, combat stereotypes and stigma, eliminate hurtful language in schools and engage people in social activities that lead to personal growth. Want to start a Unified Sports team in your school? We have the resources for you! View the Getting Started Checklist. For more information, please contact Anthony Sokenu. © 2019 Special Olympics DC.